August 2015. Four people sickened by Listeria in fish products linked to fish company, Hjerting Laks, in Denmark. Earlier in May, five cases of Listeria with two deaths were detected in Denmark. Two out of the five were of the same strain of Listeria that caused 40 cases and 16 deaths in deli meats in 2014. Although the current outbreak is not linked to the one last year, one of the five in May was traced back to Hjerting Laks. Unique culprit. While all tested samples did not reveal to have Listeria above the accepted limit, the Danish Veterinary and Food Administration (DVFA) found that Listeria isolates from the patients and samples taken from the company’s production area, equipment, and official food samples gave a DNA match after whole genome sequencing. The Listeria monocytogenes ST6 sequence pattern specific to this outbreak has not been detected in samples from other sources. Suspect: smoked fish. 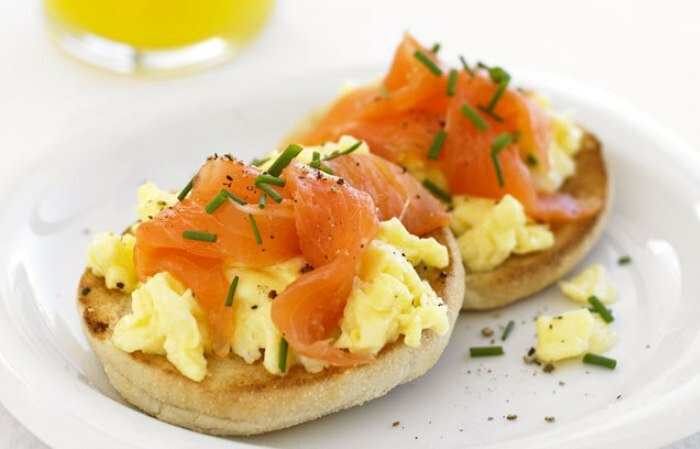 The source of infection in exact products has not been confirmed by the DVFA, but smoked salmon was suspected due to patients’ common consumption prior to illness. 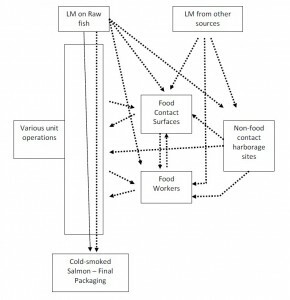 An outbreak of Listeria connected to Hjerting Laks was related to smoked halibut in November 2014, after which changes in the production processes were made. Hjerting Laks states that the bacteria from the current outbreak may have originated from raw materials supplied by sub-contractor. “We have ordered the company to change its routines with regards to production and own-check scheme,” says Annette Perge, head of unit in the DVFA. “Tightened supervision” has been placed on the company, and DVFA has advised customers to discard related fish products or return them to the place of purchase. Listeria monocytogenes. A gram positive, facultative anaerobic bacterial species capable of causing infections that may lead to symptoms of fever, muscle aches, and diarrhea. Populations including those with compromised immune responses due to age, pregnancy, and disease are typically at higher risk for listeriosis, with possible deadly effects on fetus and newborn infants. The primary route of transmission for this pathogen is through food, and especially in ready-to-eat foods that support bacterial growth of L. monocytogenes. But smoked fish? Yes, smoked fish. Smoked seafood including salmon, trout, tuna, oysters, etc., are manufactured in two primary forms: cold-smoked and hot-smoked product. Typical temperatures used for cold-smoking (22-28°C) are inadequate to inactivate L. monocytogenes, but levels of the pathogen present on raw salted fish are usually reduced by 90-99% during the cold-smoking steps of salting, drying, and smoking. Hot-smoking involves initial drying at 30-40°C, then smoking at 60-70°C followed by a second drying procedure. However, products may be contaminated after both cold and heat treatment in the processing environment while products are sliced and vacuum packaged. It also doesn’t help that Listeria can grow at refrigeration temperatures and is relative resistant to heating, acidic and high salt environments, as well as other inhibitory compounds used on foodborne microorganisms. Reduce risk for listeriosis from smoked fish by… Using ready-to-eat foods as soon as possible (product’s shelf-life shortens upon opening the packing). And remember to practice good hygiene in the kitchen! This was a really interesting report! I do like smoked sockeye and always choose hot-smoked variety, however, after reading about the chances of cross-contamination post-production, I think I will avoid consuming them prior to further cooking and heating. Since the current measures seem to be rather ineffective, I did some research to find out about alternative methods for prevention and came across a paper that reports a novel approach in controlling the growth of Listeria spp on smoked salmon, through inoculating it with Carnobacterium maltaromaticum. The authors conclude that “the bioprotective culture C. maltaromaticum can extend the commercial shelf life of both hot and cold smoked salmon”, as it outcompetes the growth of the pathogen. However, I couldn’t find any reports of this method being put to practice by food manufacturers. Smith, D. (2012, July). Biopreservation: Control of Listeria monocytogenes Growth in Hot and Cold Smoked Salmon by Carnobacterium maltaromaticum CB1. In 2012 Annual Meeting. Iafp. I really like the clever use of wordplay in your title. It highlights the opportunistic nature of Listeria monocytogenes to persist and grow in susceptible ready-to-eat foods. Given that L. monocytogenes is ubiquitous in the environment, I am not surprised that it would appear in fish, especially smoked salmon. There are Canadian regulations which require manufacturers to ensure sufficient lethality of their treatments and inactivation of their target microorganisms. If there are deviations in these standards, then the pathogen may remain and continue to be a problem. Furthermore, the smoking process is dependent on the smoke reaching the contaminated surface. The pathogen may be embedded in the flesh of the fish, where the smoke cannot make contact. Time and temperature abuse of the raw materials may also promote bacterial survival. As beautifully illustrated in your flowchart, I agree with the multiple routes of entry and carriers which contribute to the pathogen’s survival. The food matrix may be another factor since salmon is high in lipids. Fat is known to protect L. monocytogenes, which will present another challenge to eradicating this pathogen. As a consumer, I will probably reduce the consumption of this product or research more about the company before taking smoked salmon to the checkout. I read a small article saying that Listeria does not normally survive the smoking process. However, it can still grow while being stored if it is done so improperly. It can grow heat-resistant endospores if it is not smoked to a high enough temperature either (source: http://foodsafety.wisc.edu/assets/pdf_Files/smokingyourcatch.pdf). Smoked fish can also be found in shelf-stable storage (I commonly see these at Canadian souvenir stores) where it is ready to eat. This can also have an equal risk of contracting L. monocytogenes, but there may be a common misconception that shelf-stable foods are safer to consume and that the likelihood of disease could be less. I actually LOVE smoked salmon, especially when I go get sushi (where they serve smoked salmon on top of sushi). It’s pretty scary because sometimes I just see the fish wrapped at room temperature on the sushi bar… it makes me wonder if it is actually refrigerated or left out there for the whole day. This is also consumed raw – and I should probably heat/cook it instead. First thing to point out is that your layout is easy to read and your wording is short and precise! I personally don’t like eating smoked salmon not only because of the fishy taste but also because of the salty and preservative content. The smoked salmon products I have seen in supermarkets are usually those vacuum packed. Just from looking at the product, I assume the producer processed their food by controlling water activity, using of preservatives and eliminating air. 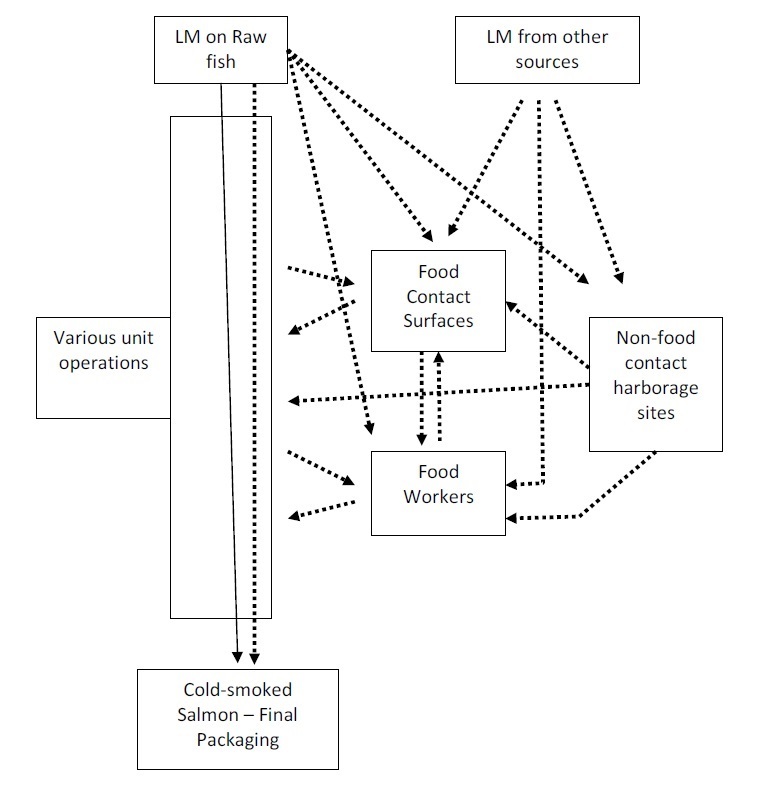 Knowing that Listeria is a relatively “resistant” bacteria that often is salt tolerant, dessication tolerant and facultative anaerobic, I can understand why it would survive so well in smoky salmon! Also another issue that comes to my mind, is that some First Nations people make their own homemade smoked salmon, which can be a possible food safety concern. I agree what Winnie has said. There are a lot of other safety hurdles used in smoked fish industry to suppress pathogen growth. Lowering water activity, adding preservatives and vacuum packaging are all examples of other hurdles used. Since Listeria has high adaptation to tough environments, only multiple hurdles used simultaneously could ensure the effectiveness. However, as learned in lectures, sub-lethal treatments could cause increased resistance to other safety treatments, so the combination of safety hurdles must be well planned and proved by scientific test results. The traditional preservation method, smoking, may not be safe for food processing if the raw material or the procedure after food processing is problematic. I love smoked salmon from deli area in Costco a lot personally. Although I cook them occasionally, I prefer eating them raw right away from the package. I will be more cautious in the future. ← Salmonella: in Frozen Raw Tuna?